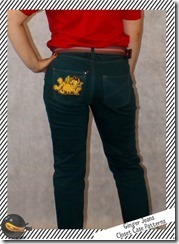 After being in possession of this pattern for a very long time, I conquered my fear of making jeans. Somehow, I managed to convince myself that making jeans it is a very difficult endeavour. Alex – https://sewrendipity.com/ – tried to tell me it is not hard to make them. But somehow I scared myself so much I still did not have the courage to start my Ginger jeans even if I already had my fabric and other supplies ready. 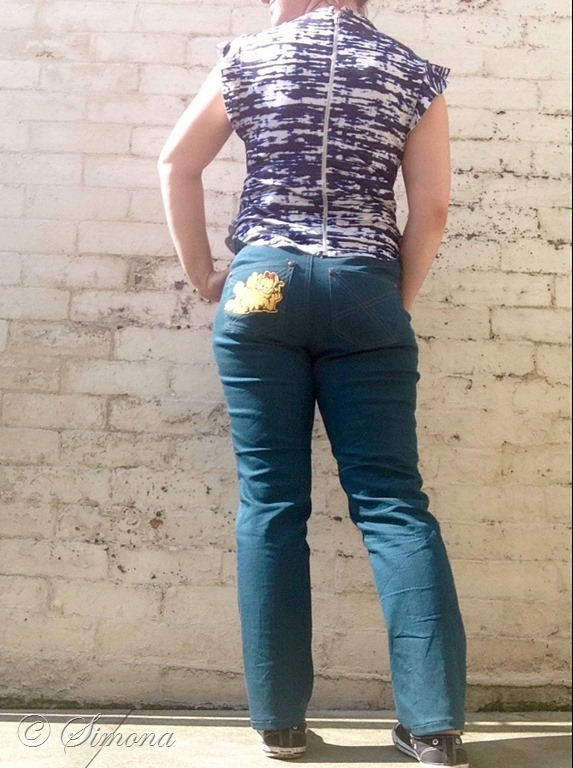 As part of Gemma’s The ‘Use it Up’ Fabric Challenge she set me was to make jeans, I decided that, now, was as good a time as any to finally make them. 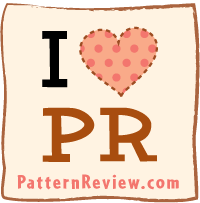 I used the Ginger Jeans pattern, the PDF version, which I got from Closet Case Patterns. 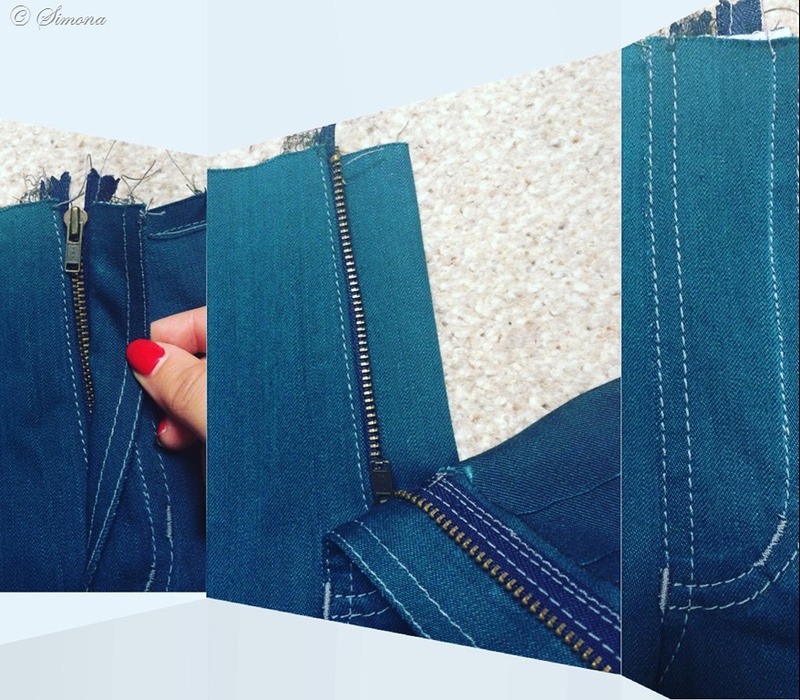 To get more help in making my jeans I purchased the e-book Heather Lou wrote about making own jeans – Sewing your own jeans. 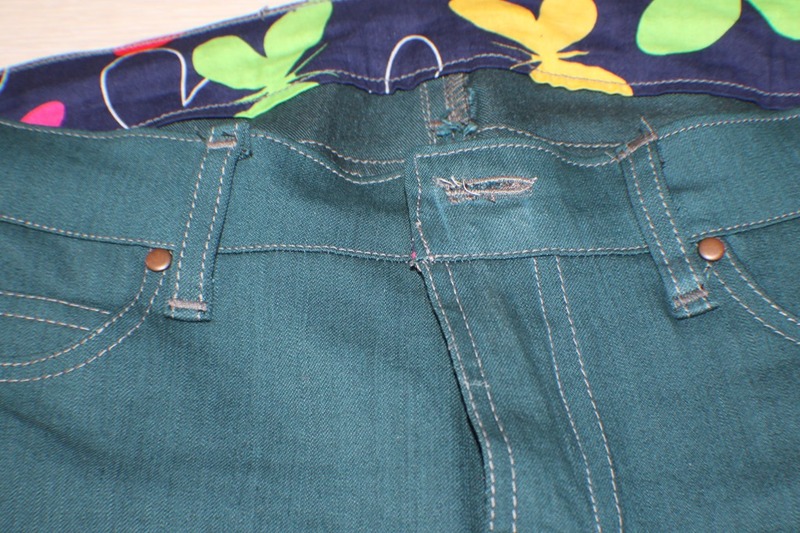 I also used the Janet Pray’s Craftsy class (Sew Better, Sew Faster: Advanced Industry Techniques) that illustrates how to make flat-felled seams without pins or trimming the seam allowance. I used fabric I bought at my local fabric store. 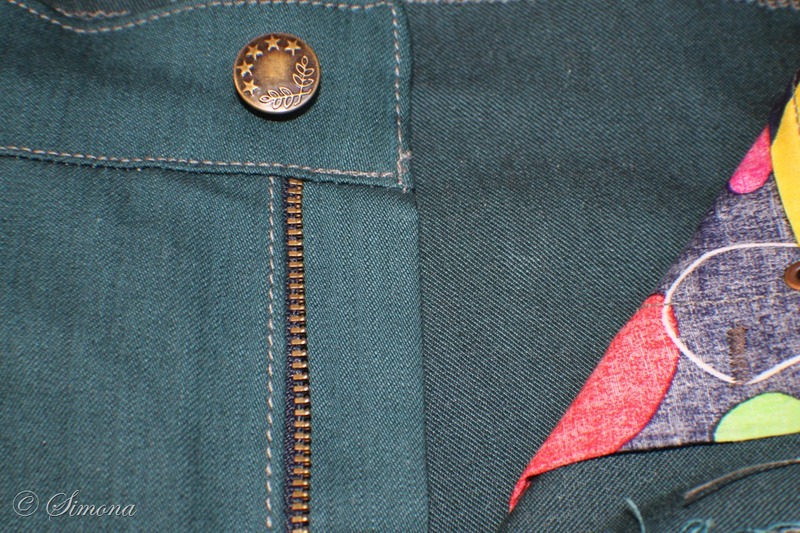 I also got some rivets, jeans buttons and topstitching thread. I used a zip from my own stash. Before starting, when tracing my pattern, I decided to lengthen the pattern by 2.5cm above the hips. Which meant lengthening all the pieces from that area. Other than that, I only shortened the legs. I did a little testing to decide what stitch length and what colour thread to use. 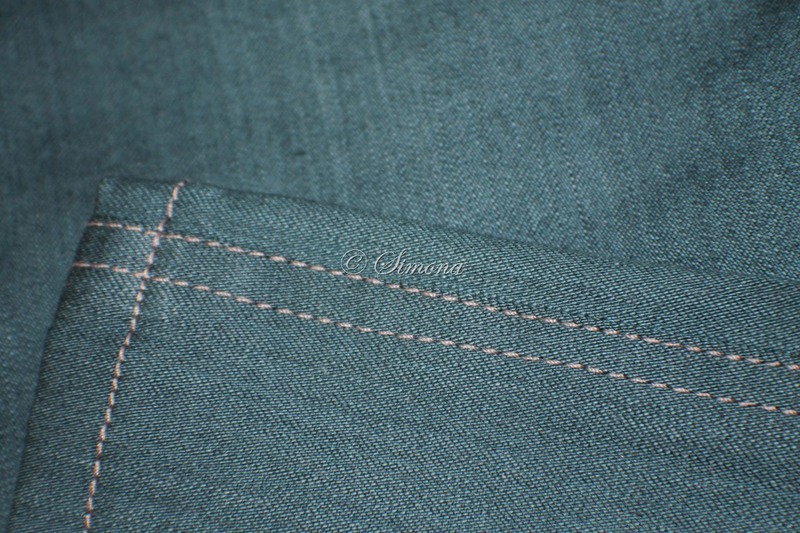 I decided that the top thread – the grey one fits best with my denim fabric. 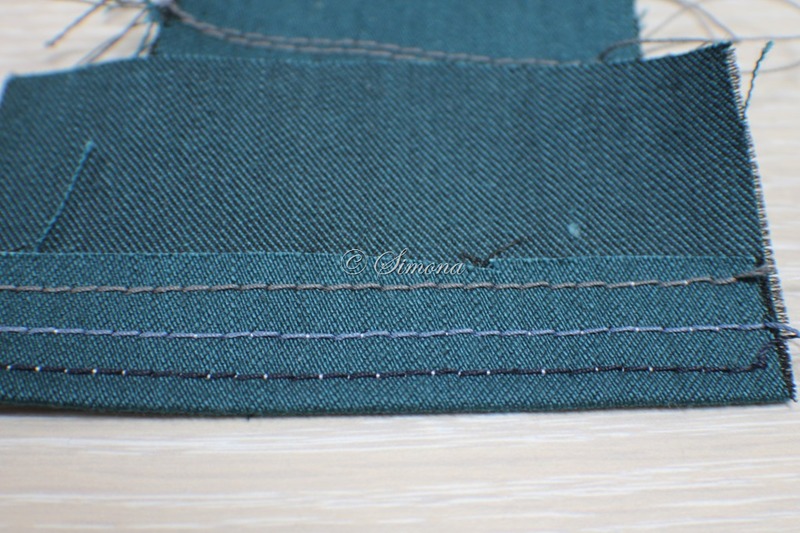 Armed with the e-book and instructions, I slowly became more confident and started work on my first pair of jeans. By mistake I cut the fusible pieces needed to stabilise the edge of the pockets in fabric, So I did not use any. Ups! But they are still ok. 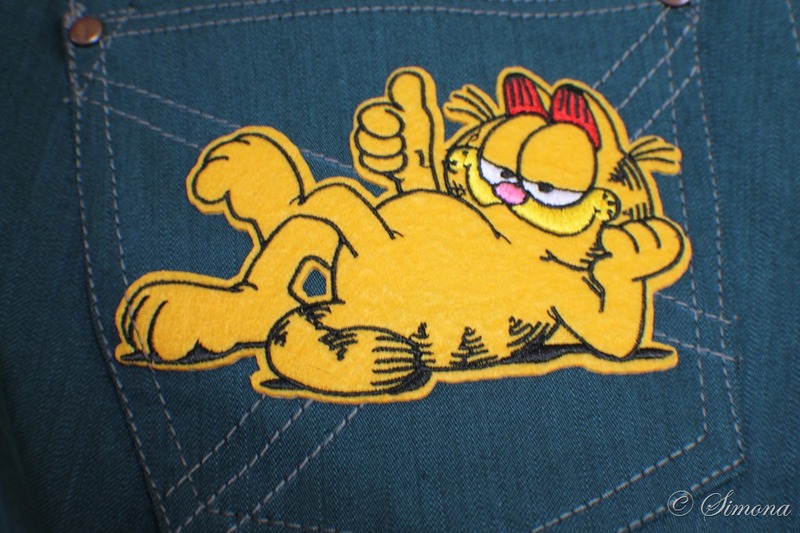 I even managed to hire the help of Garfield, his patched was at a Comic Con I’ve been to and could not help myself not to get him. 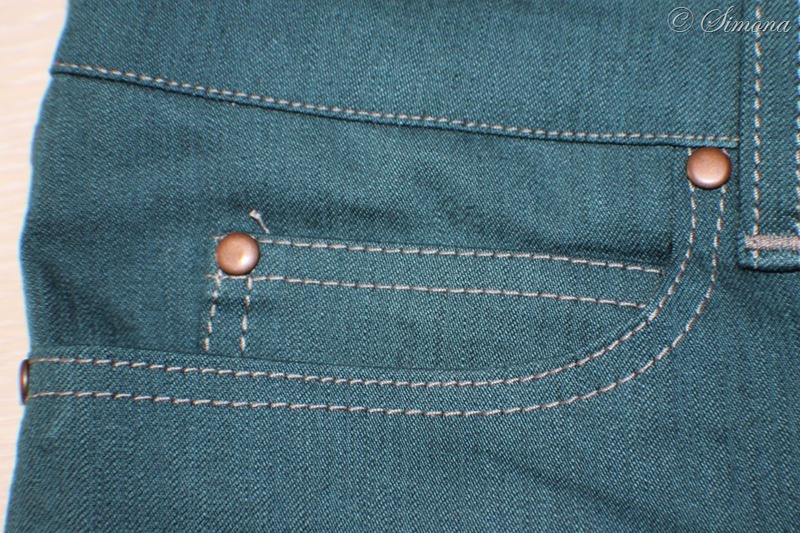 I followed Heather Lou’s advice and created my own back pocket design for the stitching (some random straight lines – not yet adventurous enough to try some curves). I thought the hardest bit will be to put the zip in. Which when in like a dream. I did make a little mistake but no biggie! No one can tell. I did struggle a little because I used a much shorter zip than the one suggested in the instructions. I am very pleased with the fly front zip. 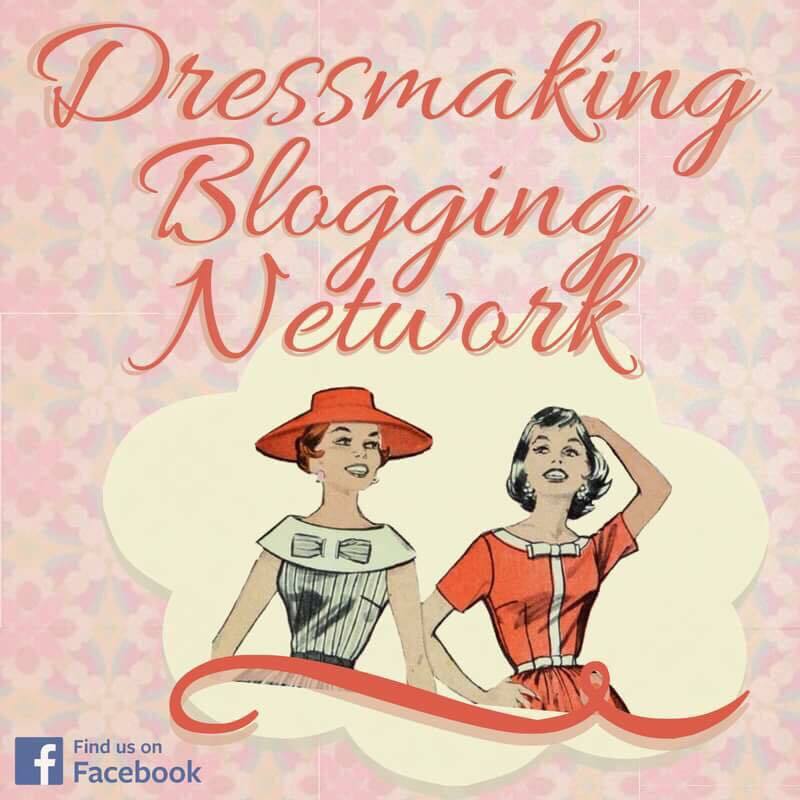 Stitching is not perfect, but as Heather Lou says in her post – called Golden Hour Ginger – I should put my unpick down. 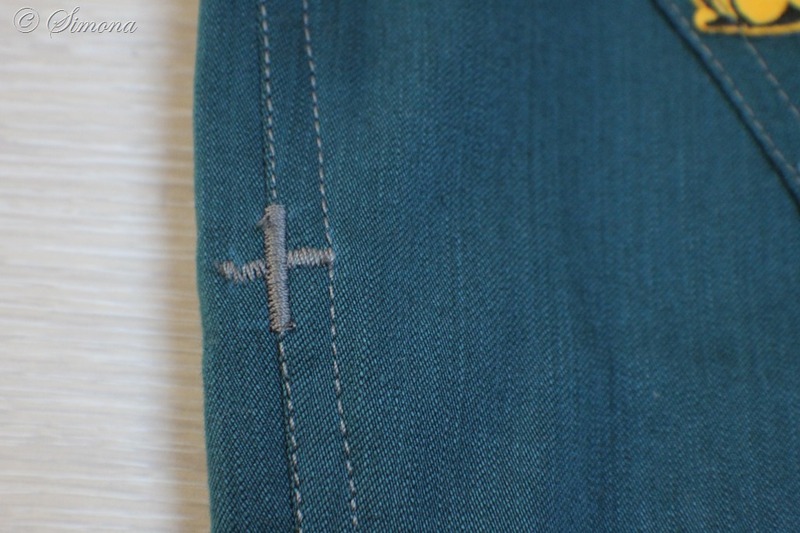 Not every stitch has to be perfect! Out of curiosity I did check a couple of my ready made jeans, and surprise, surprise. Not every stitch was perfect. What? ! Yes. So, I tried to be more forgiving on my own topstitching. Besides adding a few bar-tacks in the right place, one can hide a few sins. Ha, ha! My secret is out. But you can’t tell were the mistakes are, unless I pinpoint them to you. 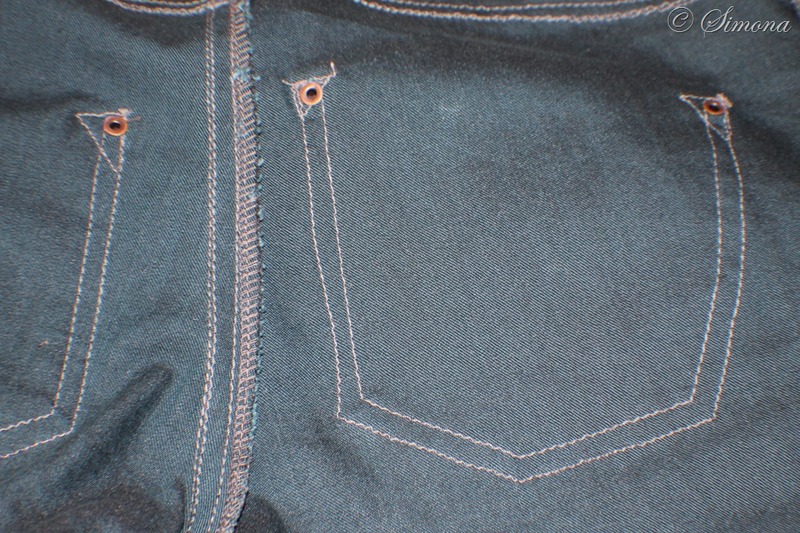 I did double top stitching on most seams, as per instructions. I used rivets pretty much on every point I have seen them on a pair of jeans. I decided that I like better to have two topstitching lines on the outside leg side seam and not the inside leg as suggested in the instructions. The only place I did not use a rivet to secure the seam was the side seam . I used bar-tack for that creating a little cross. Because I thought the waist might be a bit tight, I decided not to interface it to allow it to stretch around my body. However, it seems it is way to large. I forgot to take into account that by raising the waistband it will also be higher on my body (closer to my natural waist) meaning it will be a smaller measurement. So my pants ended up a bit to large on the waist. I will need to remove about 5 cm from the waist tapering down to nil half way the main pant leg. To wear them I am using a belt. It does not solve all my fitting problems (bunching in the back) but they are pretty wearable. I’ve already worn them a few times. So nice to have jeans to the right length. Usually they are too long. After making my first pair of Ginger Jeans I am decided to make more. I will need to change the centre back pieces to take out about 5cm at the centre back, I have the feeling this will eliminate the horizontal lines on the front as well. Right now it looks like the rise it to long. The instructions along with the e-book and the sewalong are a great resource in helping one making jeans. They are not hard to make! Waw! Can not believe I am saying this. It only took me about a year to make my first pair. Ups! Next Birthday dress or #Babydoll dress! This looks great. I’m sure better than store bought! The first pair is always the hardest, I found. Every one after is so much easier and then I worked on the fitting too! Thank you! Indeed in many ways they are better than store bought. I definitely need to work on fit a little especially around the back waistband.